Is God's word far off? Does Romans 10:14-15 teach that we need a minister to explain the Bible? Does Romans 16:25 teach that the Bible is shrouded in mystery? Does the story of Shaphan and Josiah teach that we can understand the Bible without the aid of an ordained minister? Who is God's messenger in these last days? Does 2 Peter 3:16 teach that it's impossible to understand the Bible without the help of a minister? Did the messengers who wrote scripture preach the gospel with clarity? Can an Iglesia Ni Cristo layman share the scriptures? Does 2 Peter 1:20 teach that it's impossible to understand the Bible without the help of a minister? Is it reasonable to quote the Lamsa translation of Acts 20:28? 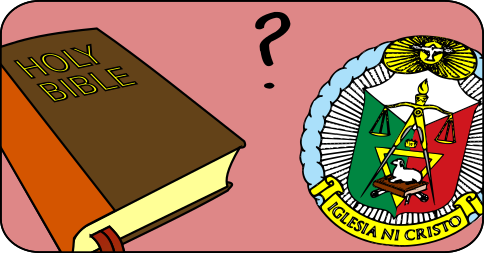 Does the Iglesia Ni Cristo interpret the Bible? Why did Jesus say that man cannot live on bread alone? What parts of the Bible do we need a messenger to understand? Did Jesus deny that he is God in Luke 24:39? Who was the God of Bethel? Does John 8:40 teach that Jesus is not God? Who appeared to Abraham at the Oaks of Mamre in Genesis 18? Did Jesus exist only as a plan? If Jesus is the Alpha and Omega, does that mean he is God? How could 1 + 1 + 1 = 1? Is it permissible to worship someone who is not God? Why Believe the Trinity if the Bible Never Mentions It? Does Hebrews 1:10 teach the pre-existence of the Christ? Does Galatians 3:16 teach that Jesus did not pre-exist? Does 1 Corinthians 3:16 teach that the Holy Spirit is God? Does Colossians 2:9 teach that Jesus is God? Does John 13:16 teach that Jesus is not God? Does 1 Corinthians 2:10-11 teach that the Holy Spirit is omniscient? Does 1 Timothy 2:5 teach that Jesus is not God? Does Acts 5:4 teach that lying to the Holy Spirit is lying to God? Does John 8:58 teach that Jesus pre-existed? Does 1 Peter 1:20 teach that Jesus was a plan? Does Colossians 1:18 teach that Jesus is not God? Do the I AM statements of Jesus prove that he is God? Does John 8:28 teach that Jesus is God? Does John 1:1-2 teach that Jesus is God? Does John 8:24 teach that Jesus is God? Did Jesus deny that he is God in Matthew 19:17, Luke 18:19, and Mark 10:18? Was Jesus the man who wrestled with Jacob? Does John 8:56 refer to judgment day? Does Colossians 1:16 teach that Jesus created the universe? Does the Father address the Son as God in Hebrews 1:8? Does John 17:3 teach that Jesus is not God? Does Colossians 1:17 teach that Jesus is God? Does Colossians 1:15 teach that Jesus is not God? Does Psalm 139:7-8 teach that the Holy Spirit is God? Is Our Lord Jesus Christ the Mighty God of Isaiah 9:6? Does John 4:24 teach that Jesus is not God? Does Christ's glory demonstrate that he is God? Does 1 Corinthians 15:27-28 teach that Jesus is not God? Do Numbers 23:19, 1 Samuel 15:29, and Hosea 11:9 prove that Jesus is not God? Who was the messenger who appeared to Samson's parents? Does Ephesians 2:8-9 teach that we are saved through faith alone? Does John 5:22-23 teach that we should worship Jesus as God? How long does it take to be saved? Does James 2 teach that we need works in addition to faith for salvation? Does Romans 4:5 teach that works are not a requirement of salvation? What was Jesus' new commandment? What does the story of the pharisee and the tax collector teach us about repentance? What Did Jesus teach about the 10 Commandments? Must the true church be called the "church of Christ"? Does the success of the Iglesia Ni Cristo prove that it is of God? Does the story of Cornelius teach that we need to become registered members of the church and be baptized in order to be saved? Does the Iglesia Ni Cristo have priests? What is the temple in the heavenly city of New Jerusalem? What does it mean to go outside the camp? If Noah was saved through the ark, is there a modern day ark that saves us? Does Zechariah 13:9 speak of the "Iglesia Ni Cristo"? Who is the One New Man of Ephesians 2:14-15? Does Isaiah 59:19 refer to the spread of the church to California and Hawaii? Does the phrase "ends of the earth" refer to the last days? Is Martin Luther the second angel of Revelation 14:8? Does a church need to be established by the fulfillment of prophecy? Was Isaiah 41:9-10 addressed to Felix Y Manalo? Does Isaiah 43:6 refer to the distant future? Does the Hebrew word "mizrach" refer to the Philippines? Does the Hebrew word "maarab" refer to the California and Hawaii? Is Felix Y Manalo the bird of prey in Isaiah 46:11? Does Isaiah 43:5 refer to the restoration of the church in the Philippines? Do the martyrs under the altar demonstrate that the dead are conscious? Does the mount of transfiguration demonstrate that the dead are conscious? Does Ecclesiastes 9:5 teach that the dead are unconscious? Does the criminal on the cross demonstrate that the dead are conscious? Does Psalm 146:4 teach that the dead are unconscious? Does the Story of Lazarus and the rich man teach that the dead are conscious? Does the story about the witch of Endor show that the dead are conscious? Is it permissible to boast about the church? Does Hebrews 10:25 teach that regular church attendance is a requirement for salvation? Should we give so that others may notice us? Is it good to have an unshakable faith? What will happen at the centennial? Why this site? Why not write about your own beliefs instead?